Heat oven to 350°F. Grease 10-inch angel food (tube) cake pan with shortening; lightly flour. In large bowl, beat cake mix, sweet potatoes, milk, nutmeg and eggs with electric mixer on low speed 1 minute, scraping bowl constantly. Beat on medium speed 3 minutes, scraping bowl occasionally. Spread in pan. Bake 45 to 50 minutes or until toothpick inserted in center comes out clean and cake is golden brown. Cool 10 minutes; remove from pan to wire rack. Cool completely, about 1 hour. Frost cake with frosting. 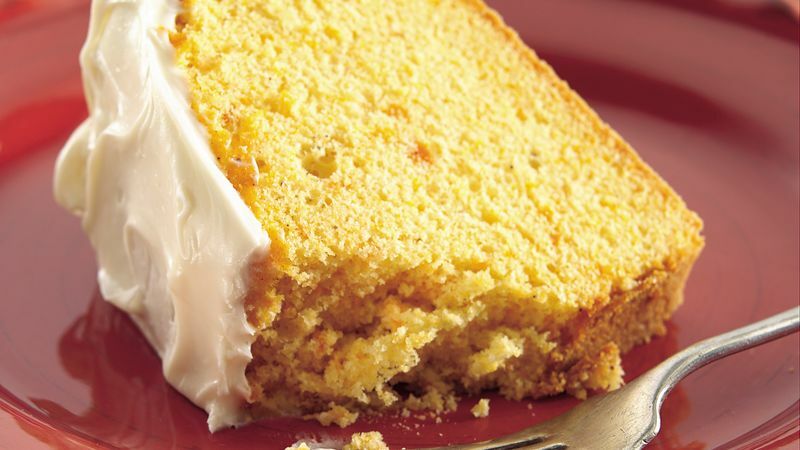 How many sweet potatoes do you need to make this yummy cake? Cook up about 2 small or 1 large sweet potato, and you'll end up with 1 cup mashed. Jazz up this sweetly spiced cake by topping with candied fruits, nuts or coconut. Next time you’re making sweet potatoes for dinner, do yourself a favor and throw in an extra potato to roast so you can make this moist and delicious sweet potato pound cake. With one cup of mashed sweet potatoes, you can whip up this cake using a box of Betty Crocker pound cake mix, milk, nutmeg, eggs and butter. It’s wonderful topped simply with Betty Crocker Rich & Creamy cream cheese frosting but if you’re feeling fancy, a handful of chopped nuts, candied fruit or coconut will take this cake over the top. Give it a try sometime when you need a little something sweet and use it as an opportunity to try out some of these tips and tricks for baking cake. Once you’ve mastered this recipe, try another of Betty’s best pound cakes.